Join us for the One Planet Council’s third annual gathering, Saturday 1st October 2016. 11am till 5pm with music afterwards into the night. Venue: The Hub, Lammas Eco Village, Tir-y-Gafel, Glandwr, Pembrokeshire (SA34 0YD). Come to find out the practical realities and possibilities for low-impact living in Wales and show support for the work of the One Planet Council. * Talks & group discussion. * Update on current planning applications. * Guided tour of the site. * Veggie meals available (price TBC). Apart from the catering, this event is put on completely free of charge by the OPC, a grass roots independent voluntary body. Donations gratefully received to further our work. September 8, 2016 in Press Releases. 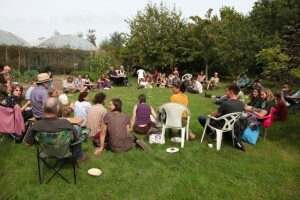 ← New milestone – 23 individual One Planet Development smallholdings now up and running in Wales!